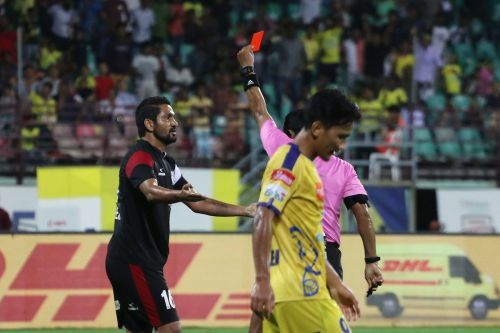 Kerala Blasters failed to make the best use of a numerical disadvantage against North East United at the Jawahar Lal Nehru Stadium in Kochi on Friday night, as they were held to a disappointing 0-0 draw in their final game of the Indian Super League (ISL) season. Nelo Vingada's men dominated the game thoroughly, but were let down by their output inside the final third in a largely one-sided affair under the lights in Kochi. The visitors, who have already booked their place in the playoffs, were handed a blow as early as the 23rd minute, when Gurwinder Singh received a straight red card for a last ditch foul on Matej Poplatnik. However, the 'Men in Yellow' failed to capitalize on the advantage as they struggled to put the finishing touch on wave after wave of attacks aimed at thwarting the Highlanders. Eelco Schattorie's men valiantly held on in the end to come away with a point under difficult circumstances to cap off what has been a memorable and historic campaign for his team in the ISL. Gurwinder Singh, who spent two years plying his trade down south for the Kerala Blasters, was deployed alongside Janeiler Rivas Palacios in the heart of the Highlanders' defence on his return to Kochi on Friday. However, the homecoming did not go according to the script after he was shown a straight red card for a mistimed last-ditch lunge on Matej Poplatnik, who was running through on goal. Kerala Blasters conjured a swift move through Len Doungel, who picked the ball up from a corner routine for the visitors, and the forward combined effectively with Courage Pekuson to set the wheels in motion for a textbook counter-attack. The Ghanaian found Poplatnik with a sublime pass that helped the striker run through on goal, before being brought down by Gurwinder Singh. 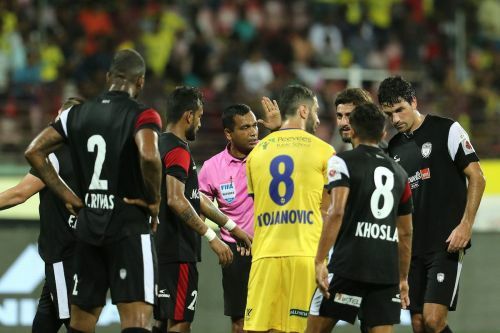 The foul had no two ways about it and the referee was forced to give the marching orders to the former Kerala Blasters star for denying Poplatnik a clear goal-scoring opportunity. The 32-year-old had been a key member of the Kerala Blasters squad during the inaugural season, but on his return to familiar territory, he was forced to take the long walk and an early bath. Not the ideal homecoming by any stretch of the imagination.